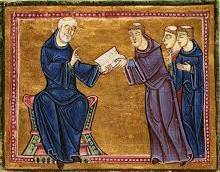 “Prefer nothing whatever to Christ,” St. Benedict says in his little Rule. And he also says, “Let all guests be received as Christ.” He wants us to put Christ first, to sit at his feet, to worship and learn from him. And then to share the love of Christ with others. Hospitality is at the very core of Benedictine spirituality, which is the background for our own Sisterhood’s Rule of Life. Basically, it is simply a way of living out the Gospel of Jesus Christ. “Prefer nothing whatever to Christ,” and “Let all guests be received as Christ.” Receive the hospitality of Jesus, and offer it to others. Christ is the beginning and the end of our longing. Christ is both host and guest. This same idea is captured in the “Great Commandment” from the Hebrew scriptures and which Jesus proclaimed: “Love the Lord your God with all your heart and all your soul and all your mind and all your strength, and your neighbour as yourself” (Luke 10:27). In the Intention of the Sisterhood’s Rule of life we call it “the two-fold law of love” – the way by which we live out our vocation of hospitality to God and from God, to our neighbour and from our neighbour. Everything in the teaching of Jesus emphasizes the importance of both loving God and loving and serving our neighbour. The wellspring from which Jesus’ ministry of healing and teaching came was his personal, intimate relationship with the Father, those times when he went off on his own, or with a small group of his friends, just to rest in the presence of God, to pray, to be quiet. A couple of days ago the Sisters welcomed eleven women to our 3 ½ week “Women at a Crossroads” program. From coast to coast in Canada, and across many decades of ages – from university to retirement – a group of women have gathered to root and ground themselves in the love of God and the teachings of Jesus, seeking direction for the next stage of their lives. We have offered hospitality to them, and they have offered hospitality to us, as they open their hearts and lives to share their dreams and hopes and fears with the rest of us. I was struck at the Eucharist this Sunday morning by how our lectionary readings (that is, the readings appointed by the church to be read each day) fit the longings and aspirations of the women who have joined us for this period of time. The gospel reading (from Luke 10:38-42) is about Jesus visiting the home of Mary and Martha, and it addresses the balance needed in that two-fold commandment – loving God so that our ministry to our neighbour will come from that deep well of love within us, rather from a sense of duty or moral obligation. It’s not a story of Mary doing the right thing and Martha the wrong thing – but in Martha’s eagerness to play host to Jesus, she seems to be missing an opportunity for him to be host to her. She just has her priorities wrong at the moment. So why is that? Well, have you ever been invited to someone’s home for dinner, looked forward to sitting down to a quiet meal and good conversation, and just enjoying being together with good friends? And have you ever found that your hosts were so eager to please that they overdid it, so the whole time you were there they were running around with no time to just sit and relax and enjoy your friendship? Or imagine an even more distracting scenario: You are facing a very difficult time in your life – someone you love is very ill or perhaps dying, or you’ve lost your job, or one of your kids has gotten into trouble. A friend who wants to be kind and supportive invites you over. What you want is to sit with them, maybe talk, maybe just be quiet together, and instead the friend races around, fusses, gets you tea, then asks if you want cake, then asks if your tea needs replenishing, etc. and you want to say, please sit down – I just need to talk with you. Please stop fussing! I think that’s what Jesus must have felt like in this narrative. He was on his way to Jerusalem for the last time, having struggled and agonized over the vocation God is calling him to, knowing he is going to be put to death and maybe even suspecting how. He is carrying a heavy emotional load, grieving, and the human side of him would be frightened too. He would need time just to be with his good friends Mary and Martha – they are people who have supported him in his ministry by welcoming him into their home, giving him a place of retreat and refuge when things were tough. While Martha busied herself making a meal, Jesus might not have felt like eating at all or if he did, would have been just as happy ordering in Chinese! So when Jesus says, “Martha, you are worried about so many things – there is only one necessary thing and Mary has the better part,” we can hear the frustration in his voice. There is a time and a season for everything, and at this moment in his life and theirs only one thing is needed – and that is for the friends to spend time together, focussed, undistracted time, in the presence of God. As Jesus demonstrated in his own life, we need a balance or a rhythm in our lives. Anybody can do loving service to another, and secular people do it all the time. But you and I are called into relationship with God, not just into a life of service in God’s name, and if we don’t stay connected to God through our prayer life, through some times of solitude and silence, then we will burn out. We will begin serving each other out of our own strength (which is very limited) rather than out of the power of God. The story of Mary and Martha is a strong invitation to us to take time out, to practice that balance of prayer and service, contemplation and action, that being a follower of Jesus means for us. The Old Testament reading (Genesis 18:1-10a) mirrors the story of Jesus’ visit to Martha and Mary. Three mysterious strangers come to Abraham and Sarah – they are assumed to be angels – messengers from God. The angels receive hospitality from Abraham and Sarah, and they also give hospitality – they take the couple into their circle of love, and out of that visit comes a miraculous child to Abraham and Sarah in their old age. The child Isaac becomes the forebear of Jesus – and that visit is so seminal in the life of our faith that New Testament commentators in the early church linked the three angelic visitors to the Holy Trinity. The icon pictured here was written by the 15th – century Russian iconographer Andre Rublev, and it has become a symbol of our relationship with the triune God. After Sarah prepares the meal, Abraham stands under the tree to watch the angelic visitors eat, and Sarah returns to her tent. 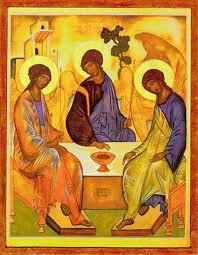 And in this icon where the meal looks like a Eucharistic chalice, the holy three invite us into the presence of God. There is a space at this table for you. Pull up a chair on the near side of the table and just sit and listen, and share with the Holy Three the longings of your own heart. You will be fed with spiritual food, your thirst quenched with spiritual drink, and you will find that deep well of love inside yourself that you may then share with others. Previous PostBarefoot Holiness and the Monastic LifeNext PostTHE SISTERS HAVE MY BACK: LIVING AS A MONASTIC IN THE WORLD. Sister Constance left me with such a feeling of what else is there to do but to accept such a loving and accepting invitation to sit down and listening to the Master. Thank you so much for such insight.